The most salacious episode yet of Chrontendo is now available to download or stream at Archive.org! Okay, there isn't really anything salacious in Chrontendo Episode 19, other than some poorly chosen names for releases from dB-Soft, Konami and Nichibutsu. You can't blame Japanese video game developers for not keeping current with US schoolyard slang... but, really, calling your game Booby Kids is pretty bizarre. Eventually, we will see the introduction of adult themed games for consoles in Japan, but today is, sadly, not that day. For now we'll need to be content with a sudden increase in sports-related titles for the Famicom. Yet another golf game from Nintendo brings the total released for the system so far to four. A new baseball game from Jaleco, and two pool games, adds up to three games for each sport. And Ring King introduces the sweetest science to the Famicom. I'm not sure what is behind this sudden surge of sports titles, but expect it continue into Episode 20. Other than that, it's a pretty quiet episode. Somewhat notable is Taito, a company that has stuck almost exclusively to arcade ports so far, jumping feet first into the action RPG market with the resoundingly unextraordinary Mirai Shinwa Jarvis. Of all the major Japanese publishers, Taito is perhaps the last name that comes to mind when you think of RPGs (other than maybe SNK). Seeing how unsuccessful their initial flirtation with the genre was, this is not surprising. How ironic that they were recently folded into Square-Enix. There's only one game that really stand out this episode, and it is, you guessed it, a Konami release, Getsufuu Maden. For once, this is not a top down action adventure game à la King Kong 2, Esper Dream and Ai Senshi Nicol, but instead a sidescrolling hack-em-up with action sequences similar to Castlevania. Added into the mix is a top down overworld which allows you to explore the game's island setting in a somewhat non-linear fashion and some less successful 3-D maze sequences. The whole thing is somewhat similar to Zelda II. What elevates Getsufuu above some its Japan-only Konami brethren are its beautiful graphics, consistently creepy enemies and a certain degree of internal coherence. In other words, no giant ducks appear in this game. And Getsufuu is quite gruesome; skulls and severed heads pop up everywhere in this game. 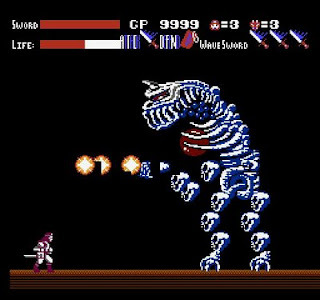 The enemies are all inventive and colorful, while the final boss is one of the most impressive to appear in an 8-bit game so far: a gigantic, multi-sprite dragon skeleton. A few odd technical issues occurred with this episode. An odd transparency effect is employed in certain parts of the game, which for some reason could not be captured on the video. Appropriately, the game's cover cannot really be photographed well. The deluxe packaging featured a cover. 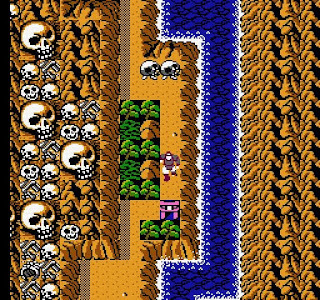 There have already been a handful of point and click style adventure games for the Famicom, but Hokkaidou Rensa Satsujin stands out from the pack by virtue of its pedigree: it's Yuji Horii's followup title to the granddaddy of all Japanese adventure games, Portopia Renzoku Satsujin Jiken. The game will not be of much interest to most western gamers - it's not been translated into English - but is fondly remembered in Japan, with ports existing on numerous platforms. Neither of these are what I would could consider good games, but they do make an interesting contrast to Getsufuu Maden, as all three fall into the "side scrolling action-adventure game plus RPG elements" genre that is so ubiquitous at this time. Both games have considerable flaws. Dr Chaos suffers from bad controls, lack of enemy variety and just plain ugliness. Zombie Hunter is simply too boring (not to mention the lack of zombies promised by the title). Oddly, both were considered acceptable for the US market - Dr Chaos was released by FCI and Zombie Hunter was prepared for US release by Activision under the new title Zombie Master, but then canceled. The closest thing to kusoge in Episode 19 is Epic Sony/ISCO's Tokoro-San no Mamorumo Semerumo. Yep, the team behind Seikima II is back, this time with a game based around Tokoro Joji, immensely popular actor, singer and TV personality. Tokoro-San would be just another lame platformer if it weren't for the absurdly limited ammo and almost non-existent health refills. The above mentioned Mirai Shinwa Jarvis also strikes a very sour chord. While bearing a certain similarity to Namco's Valkyrie no Bouken, Mirai also draws from western RPGs by letting you join guilds. The sight of your spacesuit clad adventurer entering the guild hall and emerging as a bearded, pot-bellied viking is pretty hilarious, but the slow leveling and wonky controls are no laughing matter. RPG fans are advised to stay well away from this one. The rest of the episode consists of titles that are decent, but not particularly exciting. Awesome name, but the game itself fails to live up to it. Imagine a cross between Lode Runner and Bomberman, but not nearly as fun as the Bomberman games. This US release from Data East (though it would get a Japanese release later in the year) manages to be pretty playable. For my money, though, I prefer the outrageousness of the Compile-developed Lunar Pool. Another pool game, this one taking place in a seedy back alley dive called "Konami Hustler's Club." This raises an important question: if pool hustlers frequent said club, do they really want to advertise that fact? To be a successful pool hustler, isn't it sort of critical that everyone not know you are a hustler? Konami should have put a bit more consideration into naming their pool club. Jaleco and Tose team up to produce the first installment of this long-running series (or rather, two separate ones - this diverged in Bases Loaded series and the Moero!! games). Fondly remembered in the US, but held in a certain amount of contempt in Japan, Bases Loaded attempts for more realism than Namco's cartoonish Family Stadium/RBI Baseball, but is plagued by a few technical issues. Or, "Woody Poko" as everyone seems to call it, despite Poco being dB-Soft's preferred spelling. 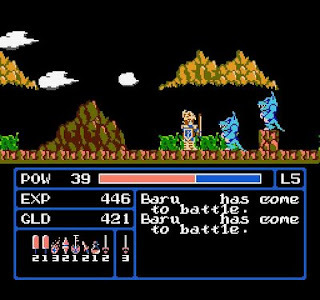 This much ported side-scroller began life on Japanese computers, before being reworked for the Famicom. A nice looking game, and one that deserves more attention than I was able to give it. A port of an arcade game by the obscure Woodplace, this was retitled by Namco to fit in with their "Family" series (Family Stadium, Family Jockey....) Ring King is pretty unremarkable and would probably be completely forgotten by now, had not the between-round cutscenes given the game a certain amount of internet infamy. 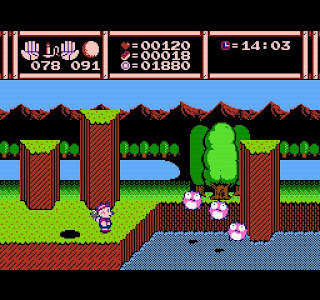 Nintendo and Hal Laboratory's sequel to Famicom Golf - Japan Course. This was, of course, the game that allowed players a chance to win a copy of the coveted gold Punch Out! Special Edition, before that game was released in stores. Interested in learning the English alphabet with the assistance of Japan's favorite cartoon cat? You are?? Then I have just the game for you! From Thinking Rabbit, the creator of Sokoban, comes this cute puzzle game. Apparently intended for a younger audience. Plus, as a bonus this episode, we have a short little look at the humble beginnings of Nintendo Power magazine, which began life as Nintendo Fun Club News. Only seven issues NFCN of were published from 1987 to 1988, but within that run it evolved from an 8 page newsletter to a full color magazine length prototype for Nintendo Power. By the way, I'm working on an idea for a new semi-regular segment within Chrontendo. Expect to see it debut in Episode 20. Until then, head on over to Archive.org to get Chrontendo Episode 19. According to Japanese Wikipedia, the plot of Woody Poco is that you are Pinocchio-style wooden boy who was turned into a real boy by a fairy. After living several happy years with his father, Poco discovers that he has been transformed back into a wooden boy, and goes out on a quest to find the fairy that transformed him in the first place. It turns out she's been kidnapped by an evil king, which I guess undid all of her spells or something. Apparently the ending credits included a message that you could send in to the game's designers, and they'd send you a bottle of the potion that turns Poco into a human (it doesn't say what the "medicine" actually consisted of). It seems a lot of Japanese games at the time did that sort of thing. However, even the Japanese appear to be clueless on what was up with Getsufuu Maden and the Genpei game. Anyway, good ep. I really liked the Nintendo Power feature. Excellent as always. Just FYI, the e in Tose is pronounced like a hard A, kind of like "toe-say." KouAidou - Thanks for the background on WP. As for the whole potion thing, that's completely nutty! Oddly it reminds of a time a bought a CD from a Japanese band at one of their shows. It came with a little pouch of some green herb. "Special blend" was the only description the guy would give me. I still have no idea what it was, but didn't appear to be anything illicit. theredeye - You are undoubtedly right about Tose. Unfortunately my background in German makes my want pronounce it sort of like "böse." Being reminded of "What's Michael?" getting published in English by Dark Horse Comics years ago, not sure if they still do nowadays. Michael also pimps for a NEC brand CD player too! The whole potion thing sounds typical of how far marketing in Japan tend to go in getting very immersed into these properties. More so than American contemporaries. Such detail on that pool table in this game! Good use of colors here. Fantastic website, I hadn't come across chrontendo.blogspot.com previously during my searches! Bothering to update, Cratermaze on the TurboGrafx-16 is certainly Booby Kids with a different name. 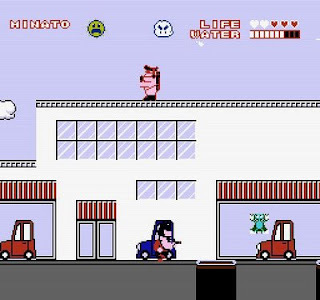 The arcade original put out in '87 was called "Kid no Hore Hore Daisakusen" and the PC Engine version simply replaces some of the characters with that from Doraemon. The Famicom port is certainly different from it. Chris, thanks for the info. Cratermaze is scheduled for Chronturbo 6, so its not that far in the future. 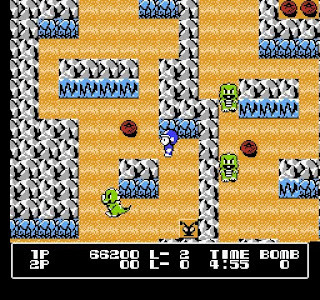 Its odd because Booby Kids seems very Bomberman-like, and it was Hudson who was responsible for the Doraemon/Cratermaze version. I guess that's an interesting way of dealing with folks who rip off your ideas.